The “Great Indy Cleanup” is coming to our area starting this Saturday. The next four weekends have opportunities for you to help make a difference in our area. All of these could use some extra hands and volunteers wanting to make a difference in the way the west side looks. Below (and attached) is additional information about some of the cleanups in the area. I know there are others, and will be glad to pass those on if details are provided to me. All of these are on a Saturday. 1.) March 30th – 34th Street from Moller Road to High School Road. St. Gabriel’s Church has organized this from 9 a.m. – 2 p.m. They are not only cleaning up 34th Street, but have plans for other work in the area as well. Meet at the church located at 6000 W. 34th Street. 2.) April 6th – 56th Street from Causeway west to Raceway Road. 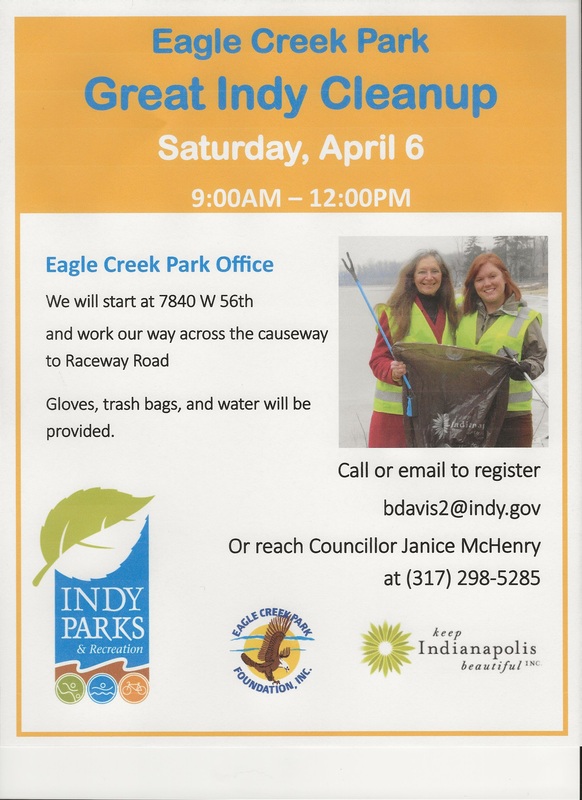 Eagle Creek Park Director Brittany Davis and I organize this annual cleanup along this portion of 56th Street every spring. Meet at the Eagle Creek Park Office located at 7840 W. 56th Street. We will be working from 9 a.m. – noon. See attached for more details. 3.) April 13th – 34th Street from Dandy Trail to I – 465. Beginning at 9 a.m. This area really needs some TLC. Meet at the corner of 34th Street and Bayhead Dr. For more information contact Peggy Johnson at 317-850-2559 or pg_johnson2000@yahoo.com. 4.) April 13th – Clermont. Starting at 9 a.m. Meet at Miller Park located on Tansel Road just north of Crawfordsville Road and across from the Town Barn. 5.) April 13th – Reed Road Area – Beginning at 9 a.m. This is organized every year by Eagle Creek Woods I. Meet at Reed Road and Wood Stream Drive. 6.) April 20th – Robey Park – Meeting at 9 a.m. – There will be tree planing, trash cleanup, and tree seedlings distributed. Meet at Robey Park by Robey Elementary School at 8700 W. 30th Street. For more information about Robey Park and other volunteer activities with them contact RobeyParkBoard@gmail.com. Hope many of you will be able to participate in one or more of these cleanups. You may select ones closest to you or what works best in your schedule. They all need more volunteers to help. Hopefully I will see you at at one or more of these cleanups. By working together we can make a huge difference in the way our area looks!